VINTAGE EPNS SILVER PLATED 1930'S CIGARETTE CASE SIZE 3 1/2" X 3 1/2"
Please see the photos for complete description I believe this is silver plated Initials as photo A, N, S. Original elastic in place Working clasp The back is showing some wear. Dispatched with Royal Mail 2nd Class. 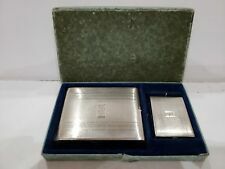 RASC Lawn Tennis Club Silver Plated Cigarette Case Singapore 1959. Silver Plated Cigarette Case Enamel Shield/Crest. Great Yarmouth No damage or repairs. Silver Plate in good order. Measures approx 3.25” x 2.5” when closed. Sold as pre-owned used items. 1. Free from damage or restoration unless otherwise stated. Aging and some crazing is to be expected. 2. Photo's provided are part of the description and any measurements given are approximate. 3. Happy to combine postage where possible. Overseas is a maximum of 2kg. 3. All items are sent with a tracking number. 4. Payment to be received with in 3 days of purchase. 5. Always happy to take questions. New listing2 X Vintage Silver Plated Cigarette Cases with Embassy Cigarette Coupons Inside. Cigarette boxes, table lighters & ashtrays. Quantity 16. Vintage Cigarette Case Silver Plated Breast Pocket Engine Turned HB HARMAN BROS.
Made by Harman Bros. Stamped EPNS between initials HB - (H. EPNS.B). Engine Turned, Panel engraved with initials GWS. ❈ A BEAUTIFUL LOBED CIGARETTE CASE. ❈ SILVER PLATED - SLIGHTLY CURVED WITH 8 LOBES. ❈ NICE HEAVY QUALITY PIECE. As such they will not be in 'new' condition. Anything else, just ask, as we don't bite. much 🐬. Excellent condition just a little tarnishing but can be polished if wanted. This Beautifully elegant piece has been designed and crafted to the highest standard. Used, silverplated cigarette case. Good condition. Vintage Silver Plated Engine Turned Cigarette Case - EPNS - 5" x 3.5"
This is silver plated, marked on the interior EPNS. I have for sale this very nice cigarette case. Condition is good, there are a few small knocks & it would benefit from a good clean & polish. MADE IN ENGLAND BY J.G. LTD. IN VERY GOOD CONDITION AND IT STILL HAS THE YELLOW ELASTIC CIGARETTE RETAINER. THE HINGES ARE VER Y GOOD. THE CATCH IS IN VERY GOOD WORKING ORDER AND IT CLOSES TIGHTLY AND SECURELY. 8 x 12.5cm cigarette case, silver plated engine turned with art deco motif. Shows wear but closes well. ARISTOCRAT H.E.P.N.S.B. 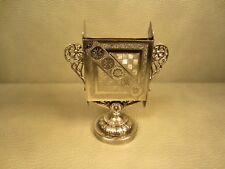 ANTIQUE SILVER PLATED CIGARETTE BOX. SILVER PLATED ON SMALL LEGS. Antique Silver Plated Cigarette Case in original box. Engraved M.C.L.M.C 4334 on it. Engraved with engine turned decoration. A Swansea badge/crest has been applied. This has been engraved with initials. This is silver plated with a gilt interior. M0248 8.5cm long Please see photographs. Part of a large and varied collection, please see other items. We combine shipping. 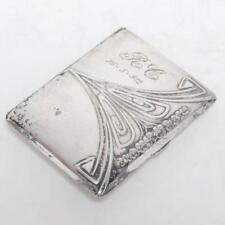 For your perusal, is a stunning Art Deco silver plate cigarette case. It has engine turned detailing to the front and back and is very tactile. Inside is gilded which gives it a luxury feel.The simple clean lines are so evocative of the Art Deco period. A Silver Plated Cigarette Box Cox. Marked 'Patent Applied For' - unusual piece. In good condition - slight surface wear. Weight approx. Marked for EPNS. Generally in sound condition with strong / positive clasp and hinges. 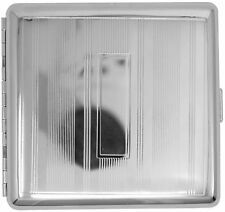 It's a bright silver colour generally, although there are a few areas where plating has worn (mainly a small area on back in one corner and around edges.). Beautiful silver plated Nelsons cigarette case. No dents and in excellent condition. Hallmark indistinguishable. 8cm x 6.5cm. Vintage Silver Plated Cigarette Case Made By C.Bros. The front is engraved with a vine effect with a shield shaped cartouche in the centre which is plain ready for your own engraving should you wish. The rear is concave in shape and plain. 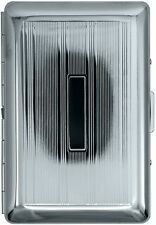 This case has been used in the past so there are some scratches to the surface and rubbing to the plating on the rear. The two straps inside are a bit loose where they have lost their elasticity due to age. Please see the photos. It is stamped with EPNS and the name C.Bros and also what looks like a letter L. The size of the case is approx 9cm x 8cm. This is a lovely stylish cigarette case. It has a machine turned design that gives a herringbone effect. The case has an cigarette elastic stay. It has remarkably little evidence of use. Internally the case has been left plain and it is stamped in one corner with. Aristocrat Silver Plated Table Cigarette /Cigar/ Trinket Box,With wood lining Made in England. VINTAGE 1940'S SILVER PLATE CIGARETTE CASE 3 1/4" X 5 1/2"
Approx size 88 x 75 x 16mm.